Have you ever dreamed of solving a mystery that the experts couldn’t solve? In this collection by a well-known author, the young sleuth, Larry, finds solutions to five mysteries that baffled the professionals on the police force. Asimov provides clues in these fast-paced stories that invite alert readers to pit their powers of observation against Larry’s. The stories deal with a jewel thief who disappeared right under the nose of the arresting officer, the vindication of a poor man who stole to help his sickly wife, the solving of a murder, a twin swicheroo, and the identification of an undercover agent. 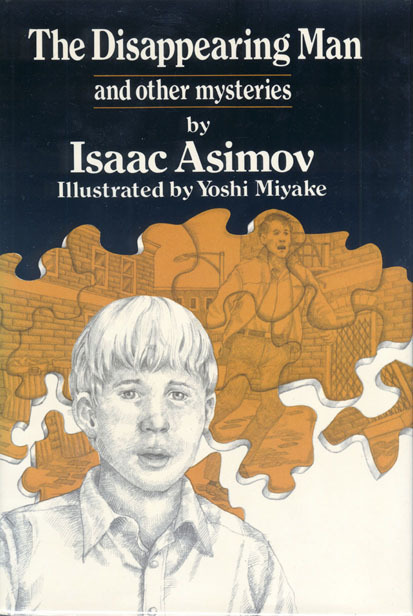 This collection is a companion to Asimov’s THE KEY WORD AND OTHER MYSTERIES. This is the second collection of "Larry" mysteries, written for a younger audience. (The first collection is The Key Word and Other Mysteries.) Three of the five stories originally appeared in Boys’ Life, a magazine for Boy Scouts, and two are original to this anthology. As before, we have our young protagonist, Larry, who helps his policeman father solve baffling mysteries. I am perhaps less fond of the stories in this collection than The Key Word and Other Mysteries, but that’s mainly because my subscription to Boys' Life ran out before they appeared in it. On the whole, they‘re fairly good for a younger audience. Only ”The Twins” did I think really stretched to get a solution. ”The Man in the Park” also was a little bit “off” for me, because of the involvement of the Japanese writing system. (Fortunately for the book, the illustrator is Japanese, and so the picture for the story actually shows some correct Japanese text.) Asimov betrays here, I think, his own ignorance of how Japanese is written, because the story turns on the fact that someone unfamiliar with Japanese wouldn’t know if it were written upside down or not. In order to test him, Larry copies by hand a six lines of Japanese text and carefully makes sure the lines are even so that the paragraph indentation won’t give away the orientation of the text. What else to say about the collection? Not much, really. The stories here are “typical” Asimov mysteries, turning on clever little puzzles. A younger audience should be able to read and enjoy them; they are a bit short and simple for the older audience, but still, perhaps worthwhile for the fan of Asimov’s mysteries.